The term blue blood originated in Spain. It was used to differentiate between people with light skin from those with darker complexions. The veins of southern Europeans appeared more blue due to their pale and translucent skin. 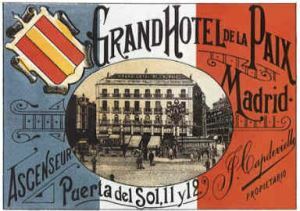 Wealthy landowners or their descendents were part of an upper class in Spain that were called blue-bloods or blue-blooded. Also in the late 1500s, a person of nobility in Spain was known as a hidalgo. Hidalgo derived from the term fijo dalgo and later hijo dalgo, and referred to a large property owner or the son of such a person. A hidalgo was also likely called a blue blood. An article in the October 20, 1852 New York Times talks about Mozart and his opera Don Giovanni, with a fictional lead character who was young, arrogant, and of nobility, using both terms: "The Don Giovanni of Mozart, on the contrary, is as regular a hidalgo as blue blood at the boiling point could make him; as fierce and haughty as Satan; and, like him, never humbling himself before any creature mortal or immoral...."
In Boston in 1859, Oliver Wendell Holmes had published The Professor's Story, and wrote about The Brahmin Caste of New England. In 1858, he had earlier described the State House of Massachusetts in The Autocrat of the Breakfast-Table as being the Hub of the Universe. Both works at the time were considered self-aggrandizing propaganda for the wealthy class in Boston, and quite arrogant. Holmes' writings, and audacity, especially after Autocrat was published and the national reaction to this work, is likely the reason why the term Boston Blue Blood was coined. Blue Blood had of course existed in the English language for many years previously. In the late 1850s, the Back Bay District in Boston was filled in, which created a lot of very expensive real estate. Residents of Beacon Hill, and other wealthy Bostonians, quickly began moving into the Back Bay. The March 21, 1861 issue of the Boston Medical and Surgical Journal sarcastically states: "the blue blood of the Back Bay is refreshed with breezes wafted over the fragrant debris of a rural hill in Needham" in contrast to the city dumping trash in a poor neighborhood of Boston (the landfill material for Back Bay was hauled from Needham). By the 1870s, the term Boston Blue Blood was widespread and the definition had narrowed to wealthy Bostonians that were generally members of the Republican Party. The Brahmins or Blue Bloods had great influence in Massachusetts politics. During a gubernatorial race, the September 29, 1875 New York Times talks about Republican candidate William Gaston, "It is urged against him that he is cold and 'aristocratic,' and the commonest cry of his opponents is that he 'represents Beacon Street,' a locality which, in ancient times, was supposed to lodge all the city families of blue blood and high degree." After William Gaston was elected, the December 13, 1875 Boston Globe published a letter by Democrats opposed to the Republican government, "To the Citizens of Boston: The rights you possess are in danger. The wealth, self-stated aristocrats and and the men who claim blue blood in their veins have conspired against you. The select few, the money vaults of State street, the luxurious palaces of Beacon Hill and the Back Bay, the inheritors of wealth, the men who have reduced the wages of the working man to the verge of starvation and the level of the poor house...."
This author also believes that Clark's Boston Blue Book greatly contributed to Boston society people being called Blue Bloods. 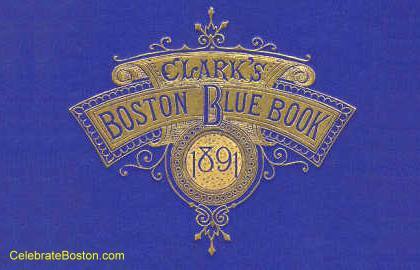 The Blue Book was an extensive directory of Boston's citizens. Prominent areas of the city had lists of residents by street name. Clark's also listed members of the society leagues, such as the Algonquin and Somerset Clubs. Related, in the 1800s, many laws restricted business and sale of alcohol on Sundays, and were known as the Blue Laws. In the past 30 years, most states have repealed or weakened their Blue Laws. In colonial times, Blue Laws were passed in observation of the Christian Sabbath. In modern times, they were enacted to provide a uniform day of rest. The term Blue Law does not relate to Blue Blood. In the 1800's, Blue referred to strict religious conviction, and as an example, using casual language, a Blue Nose was a person with such convictions. A puritan ban against kissing in public was an early blue law.